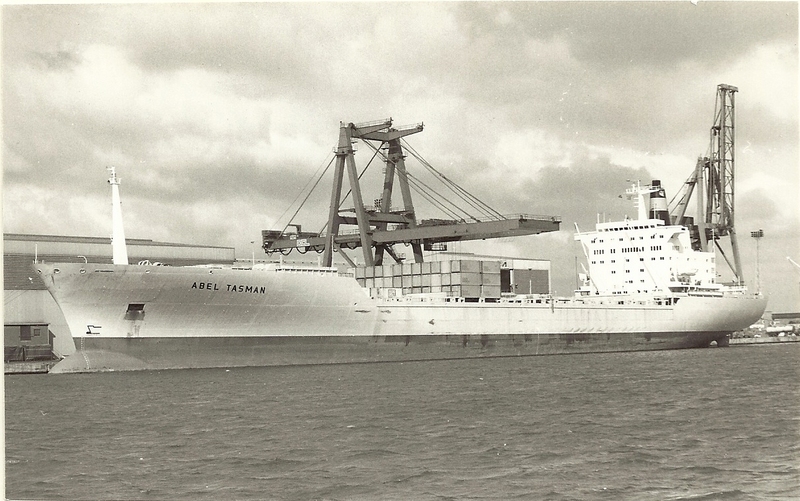 ABEL TASMAN was an early container ship. When new in March 1971, the containership ABEL TASMAN (27,614 tons gross) was the largest ”cargo liner” in the fleet of Nedlloyd Lines, of Rotterdam, and there was much interest in the vessel when it first called at Tilbury in April. It joined the six “Bay” boats and two German and one French containership on the container joint service from NW Europe to Australia, and kept going in this for a few years. It even ran on a short charter to Overseas Containers Ltd (OCL) and for this was named MOUNTS BAY. Maybe it was its steam turbine machinery that was causing problems, or something else, but by 1984 the vessel, by now named NEDLLOYD TASMAN, was becoming a bit of a liability and it was decided that she would be withdrawn from service. She was renamed TASMAN that year and later, in March 1986, one day short of her 15th birthday, she arrived at a scrapyard in Taiwan.